Susan Cooper (Melissa McCarthy) is a desk-bound CIA analyst, whose main role involves guiding fellow agent Bradley Fine (Jude Law) through his missions via earpiece. After Fine fails one of his missions by accidentally killing his target, his target's daughter Rayna (Rose Byrne) reveals she knows the identities of each CIA spy. After Rayna threatens the country with nuclear weaponry, the CIA has only one choice; send in an agent who has never been used out on the field as a spy. That agent is Susan Cooper. Since stealing the spotlight in the rather brilliant Bridesmaids back in 2011, Melissa McCarthy has appeared in an endless run of comedies, some more appealing than the others. For example, Identity Thief was a classic example of a solid comedy idea with poor execution, and McCarthy wound up playing the same character in each film she appeared in. Yet here comes Spy, seemingly the film to break McCarthy out of her mold and into something fresh. Does it succeed? Here and there, Spy gives McCarthy more to do than she's been given before, but when you strip away the genre style it doesn't feel a far cry away from what we're used to. Nonetheless, Spy is a consistently engaging comedy that, while never really reaching the hilarious heights of Bridesmaids, never forgets to just have fun. One of the most enjoyable elements of Spy is its story, which, unlike many other spy-comedies (Get Smart, Johnny English..etc) actually offers something of interest. Most other entries of this rather niche sub-genre feel content to rely on a borderline offensively thin story, focusing instead entirely on the laughs and the action. Spy remembers to keep the story going, and takes us to places we don't expect to go to. It may struggle to begin with (the first act feels painfully familiar to every other genre entry and fails to stand on its own feet), but once Susan is out in the field the pace quickens, the laughs come faster and the action picks up. It does go a little bombastic at the end, with a helicopter sequence not too dissimilar from that of 22 Jump Street (a far superior comedy), but once the film gets on track it's hard not to have fun. 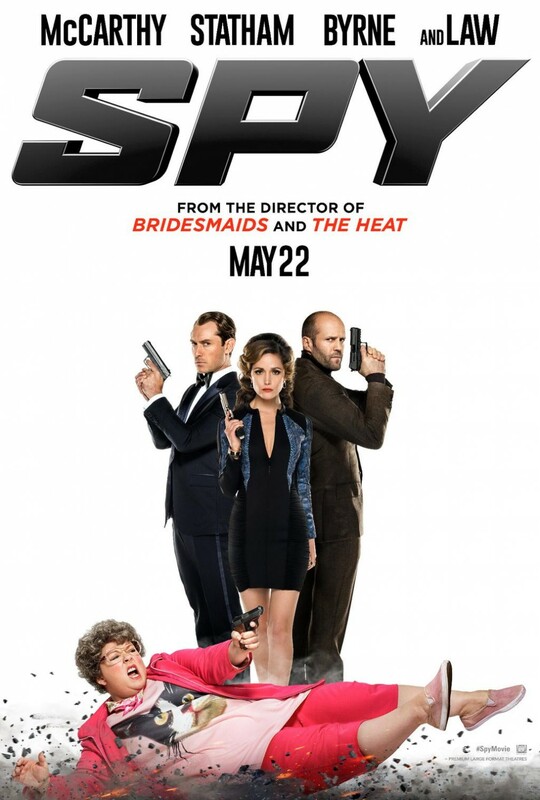 Spy is also boosted greatly by the fact that it is jam-packed with great actors doing a great job. McCarthy really comes into her own here, despite her character feeling far too familiar to her other roles. But it is refreshing for writer Paul Feig to allow Susan to bypass the whole "bad spy becomes good spy" stage. She may not have it easy, but Susan is never shown to be bad at her job, allowing room for both narrative coherency and a more emotional style of character development. Byrne is also terrific (when is she not?) as the film's central villain; she may not be a nice character, but Byrne injects a perfect amount of fun into her performance, allowing Rayna to fall seamlessly into the Villains You Love to Hate category. Unsurprisingly for me, Miranda Hart also excels in her first big screen appearance. In a role written solely for her, she delivers each and every joke with effortless comic precision, providing a large handful of the films biggest laughs. Jason Statham is also refreshingly different here, but both him and Law are entirely overshadowed by the film's supreme female cast. However, Spy takes an odd approach to its presentation of humour. Whilst it offers some great one liners throughout ("Who puts a roof on a scooter, what are you, the Pope?" is a particular highlight), Feig's script bounces between physical comedy, written gags and toilet humour so rapidly it could leave you with whiplash. It's hard to know what to expect, and in most films this tends to work in their favour, but Spy never really pushes for greatness with its comedy. It is consistently funny once the pace quickens, and you don't really go five minutes without chuckling, but it's never truly hilarious. Whilst I vividly remember having a good time watching the film, I'm struggling to remember more than three great moments. Whereas Bridesmaids, another Feig/McCarthy collaboration, offered a basket-full of hilarity, Spy is content with a trolley-full of fun. You'll find it hard to be bored, but you won't be falling out of your seat laughing either. The best word I can use to describe Spy is "fun". It isn't a film to go raving about, but it certainly isn't a train wreck either. McCarthy, Byrne and Hart give terrific performances, and it's refreshing to have a spy-comedy with a genuinely interesting story, but the humour never really excels to the height it could. Still, I would rather have a film that offers consistently solid laughs than a film that presents two or three moments of excellence and falls flat in between. McCarthy and Feig seem to bring out the best in each other, and I hope these two continue to collaborate and experiment with different genres. McCarthy may not be the most diverse actress on the big screen today, but she is one of the most likable and entertaining on-screen presences in a long time. Add to that a compelling story, some solid humour, a worthy supporting cast and a fistful of pure, timeless fun, and you'll be hard pressed not to stand up smiling by the time the credits roll. 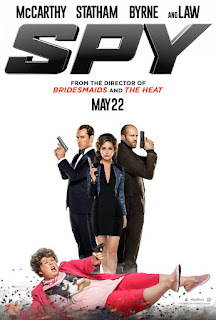 To Summarise: It struggles to differentiate itself from other films of the same genre and doesn't push its humour as far as it could, but Spy is a consistent blast of entertainment thanks to its fun characters, smart plot and stellar performances from its three female leads.